If you create lots of charts in Microsoft Excel at some point you'll have become bored with applying the same formatting options to each new chart that you create. Fortunately, Excel allows you to save a custom chart type that you can use as a template for charts that you create in the future. Not the prettiest chart you've ever seen, but it takes a long time to apply all of the formatting options. Once you've perfected your chart you're ready to save it as a custom chart type. The technique for doing this is different in different versions of Excel. 3. Select the Custom Types tab. 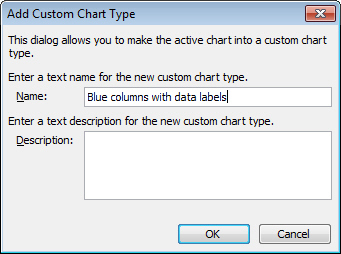 On the next dialog box enter a name for your custom chart and then click OK. 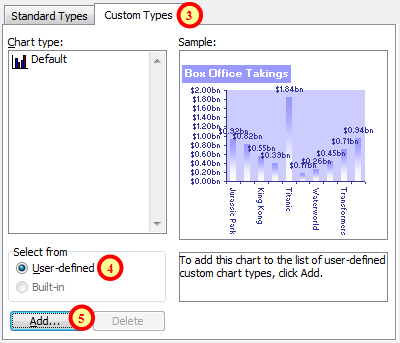 Enter a name and optionally add a description for your custom chart. Click OK once more to finish creating your custom chart type. And that's it! 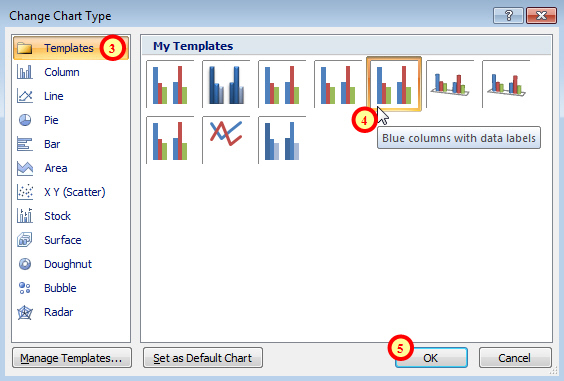 Once you've saved a custom chart type you can use it again in any other Excel file that you create. A new, basic column chart based on different data. When you click OK the new chart will take on all of the formatting properties that are saved in the custom chart type. Notice that the custom chart type also applies the same title as the chart that was used to create the custom type. Select the chart and from the Ribbon select: Design -> Save As Template. You can change the file location if you want to, but it's better to stick with the default Templates folder. Type in a sensible name for your chart template. And that's it! 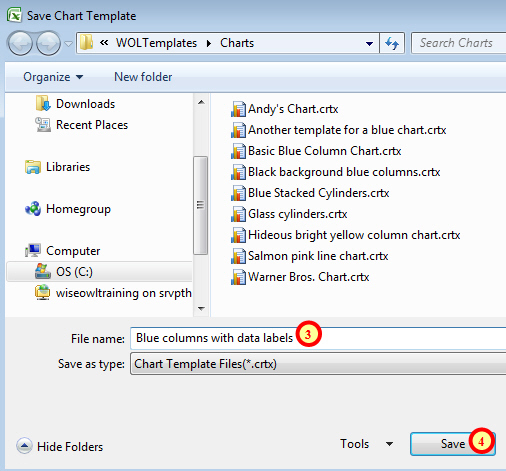 You can now use your custom chart template in any new file that you create. Unfortunately, you have to hover the mouse cursor over an icon to actually see which chart template you are selecting! Select the Templates folder to see all of the custom chart templates you have saved (Excel will look in your default Templates folder). Find the specific template you want and click on it to select it - stupidly you have to hover the mouse cursor over the template in order to actually see what it is! Unlike in Excel 2003, Excel 2007 and 2010 don't use the same text for the chart title, just the formatting. And that's it! 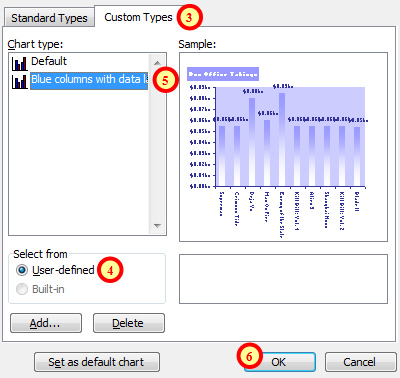 You can create as many custom charts as you like in order to save you lots of time when formatting charts in future. If you find yourself using the same custom chart type for most of the charts you create you can save yourself even more time by setting it as the default chart type. See this blog for instructions on how to do this.